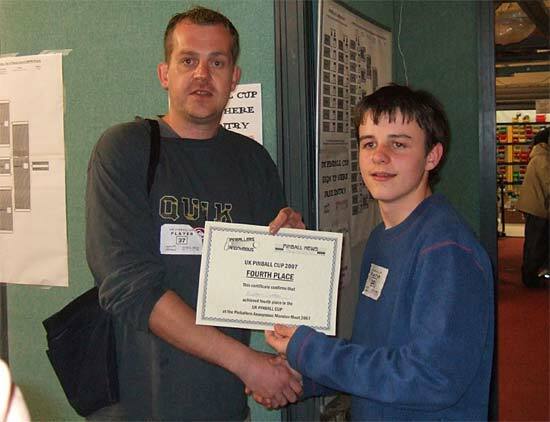 Date: 26th - 28th May 2007. 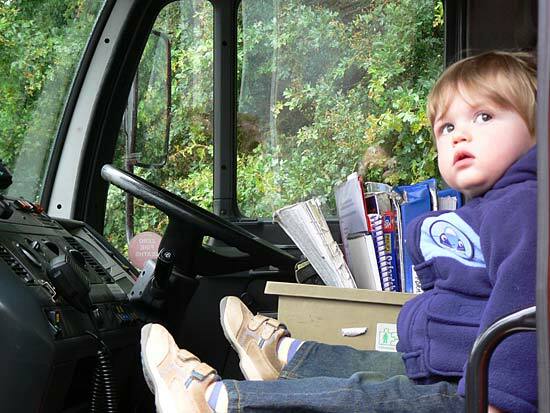 Photos by: Gary Flower, John Higgins, David and William Dutton, Pins Anon and Pinball News. 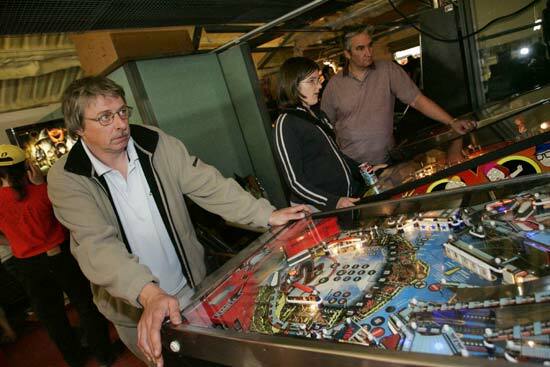 The last weekend in May saw the Pinballers Anonymous Monster Meet at their base in rural Buckinghamshire, about 30 miles outside London. 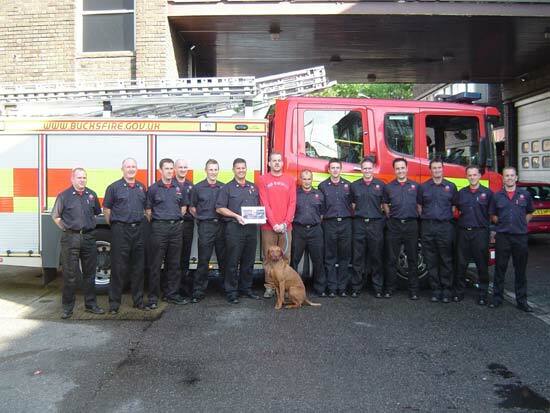 This was the second such event, the first being held two years ago at their old home just a hundred yards or so down the road, and this time was a three day event, running from Saturday morning to Monday evening, organised by Pins Anon's Nick Bennett. 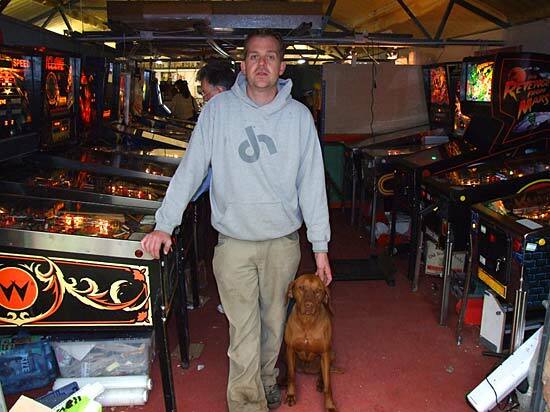 Nick not only buys and sells games and parts, but is also the driving force behind the UK Pinball Show which will hold its third annual event this September. The Monday was a public holiday long weekend, so true to form, the great British weather did not disappoint - it rained almost continuously from Saturday through to Monday. But despite that, 130 people came over the three days, each paying £5 ($10) for entry. 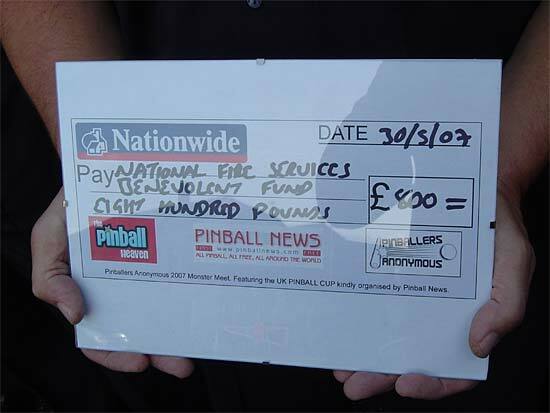 That £5 covered them for all three days and all the money raised from the entry fees, the pool table coin box, other donations, money from the sale of donated pinball fridge magnets from Neil and Kim, and the drinks fund all went to the Fire Services National Benevolent Fund, a cause close to Nick's heart. 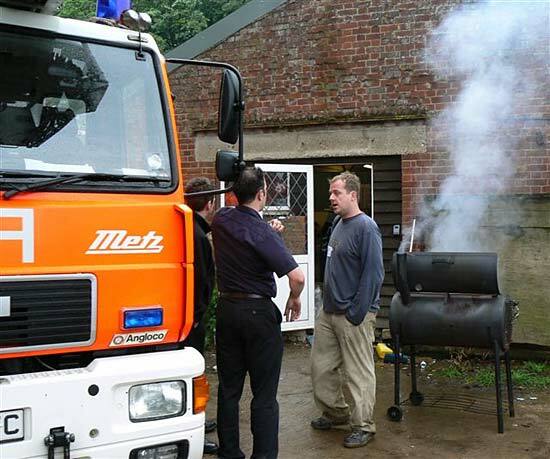 The Fire Service turned up on Sunday, not because the barbeque got out of hand, but to lend their support and to show some of the youngsters around the inside of a fire truck. Back in the dry, inside the main hall there were 26 games set up to play, although one was taken away on Saturday night and another on Sunday. While the majority were in very good condition, a few of them suffered from weak flippers after the long periods of play you get at events such as this. If, like those games, you needed a rest from constant play, at the rear of the Pinballers Anonymous building was a marquee loaded with boxes and racks of spare parts, all for sale. 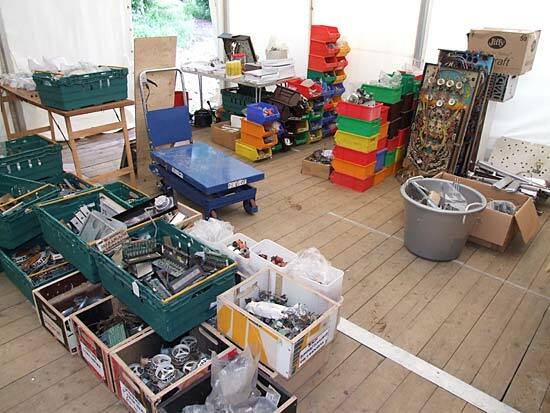 This lot normally lives inside the main building but for the event, some of that space had been taken up extra games and some with a demonstration of EM pinball repair by Baz and Dave, who showed several machines in various stages of reconstruction, and worked on them during the weekend. 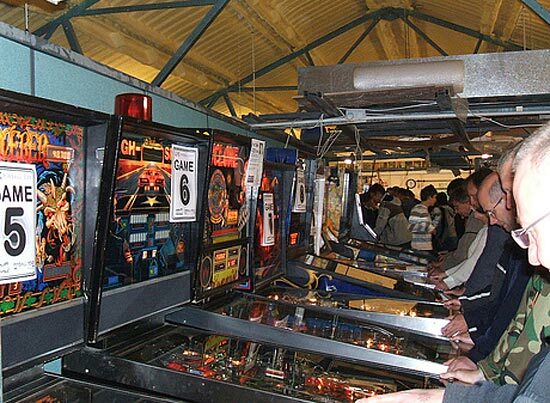 But the Monster Meet wasn't just a chance to play a lot of pinball, buy parts and talk with fellow fans from around the UK, because there were competitions to compete in too. 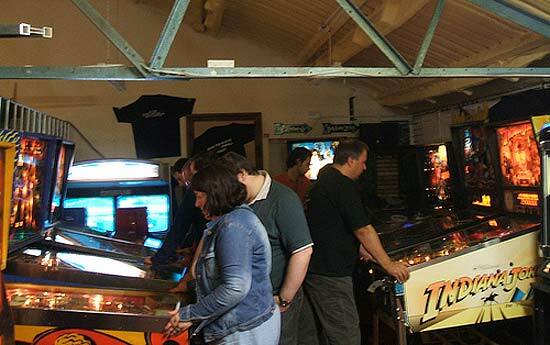 On Saturday, the London & SE division of the UK Pinball League held their 4th meeting, battling for league position, qualifying for the UK Pinball Open in September and WPPR points. Play was on 5 of the games - Star Trek-TNG, Fish Tales, Rocky & Bullwinkle, Indiana Jones and Family Guy with players' scores ranked against other scores and points awarded. The winner was newcomer Christina Staines who performed consistently well to earn the most points and win 6 WPPR points. Second, with 4 WPPR points was host Nick Bennett, followed by Roy Bussink and Sean Rowe with 2 and 1 WPPR points respectively. 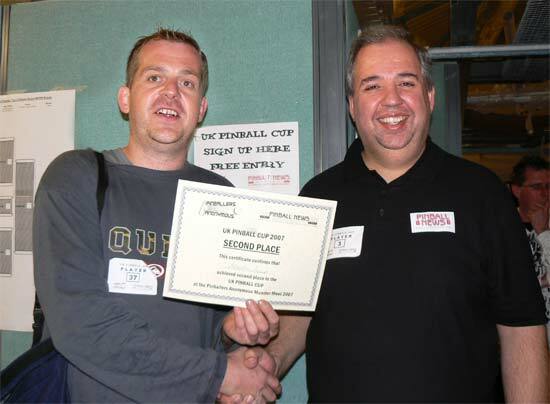 Sunday was the big tournament day with the first ever UK Pinball Cup held. 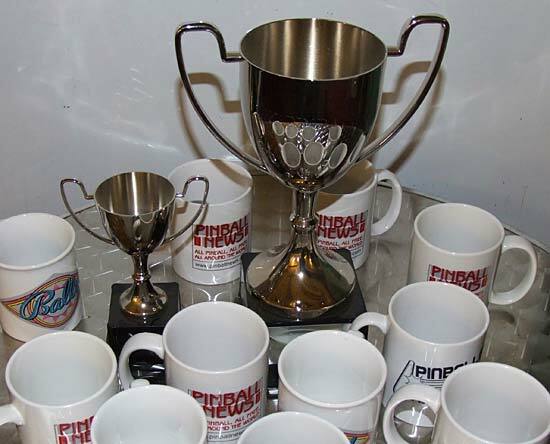 The UK Pinball Cup and its little brother, surrounded by prize mugs. 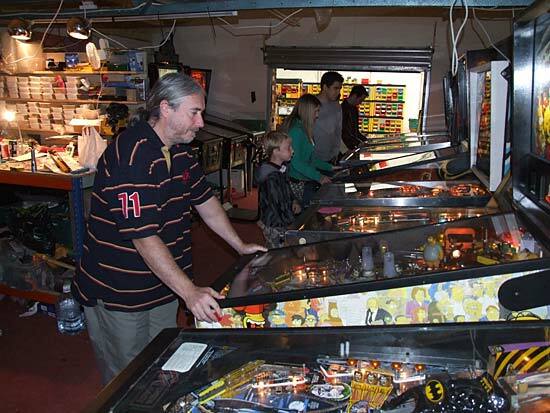 It was organised by Pinball News and saw 54 competitors - all but a handful of those present - signing up to take part in the head-to-head single elimination sudden death format played out on the best 16 machines. Entry was free for those attending the Monster Meet. All players were allocated player numbers and an initial qualifying round saw the 54 reduced to 32 through a mix of three and four player games with the top two qualifying. 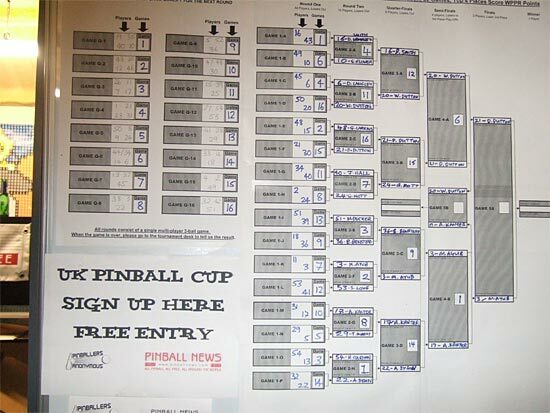 The players in each game were chosen by drawing numbered balls from a box and their progress through the tournament was documented on a large paper display. 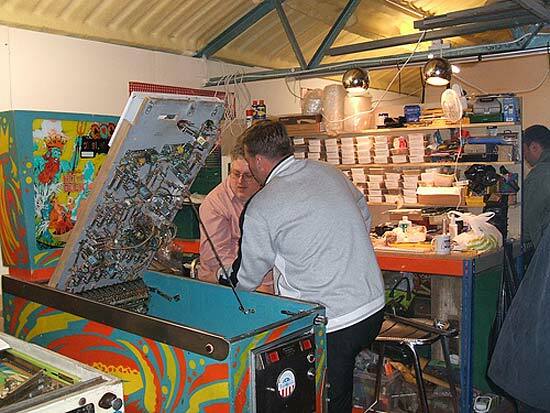 In the first round proper, the remaining 32 players were randomly drawn against another player to play on a randomly drawn machine with the winner progressing. This reduced the numbers to 16 after which players followed a pre-planned progression but playing on randomly drawn machines to prevent any practicing on their next machine between rounds. It was soon down to the final four with father and son team David and William Dutton playing each other in one semi-final, while Anke Kanter played Martin Ayub in the second semi-final. 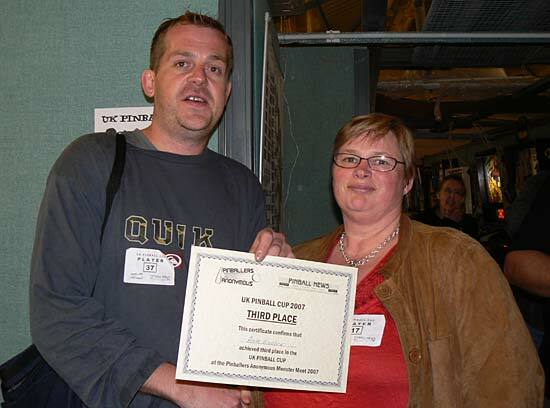 David and Martin were the winners who went on to the final, with William and Anke playing for third/fourth places. 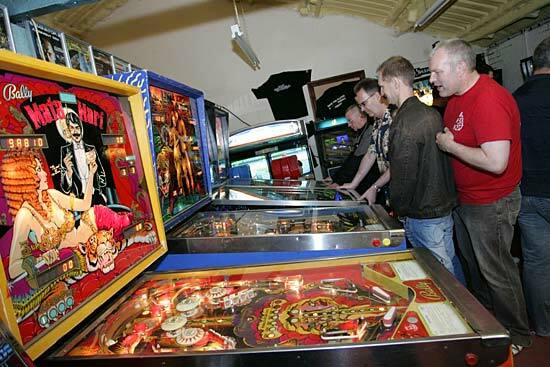 The machines for the final rounds were chosen so neither player had played them in the competition so far, which meant Fish Tales for the third/fourth place play-off and Batman for the final. The Fish Tales had to be the meanest playing example around, leaving neither player much chance to shine, but Anke beat William for the third place. 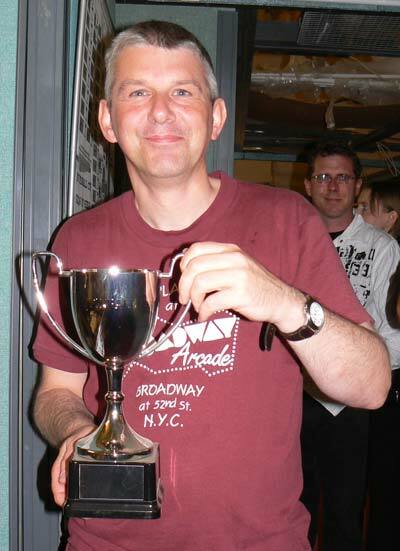 In the final, David gained a convincing lead over Martin after the first ball on Batman, which he extended with the second and third to take the title. David got his name engraved on the cup and received a smaller replica to keep. 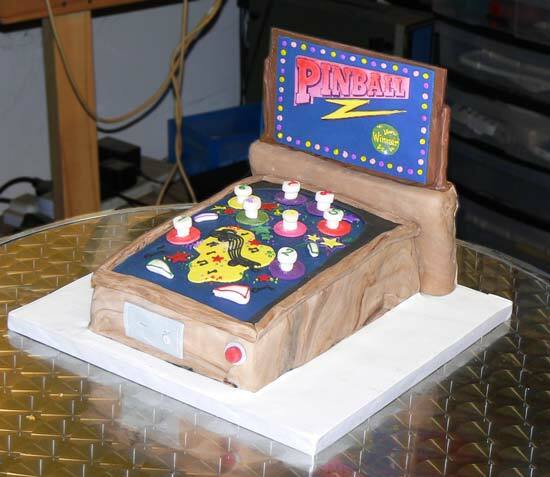 He also won 25 WPPR points, a certificate, and got to cut this impressive pinball cake bought by Nick for the event. Martin received 15 WPPR points, Anke 10 points and William 5. 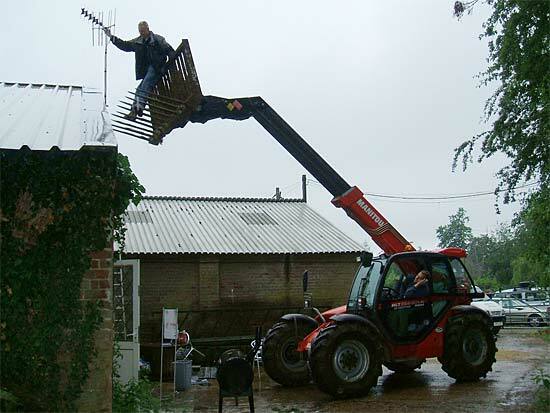 Sunday also saw this novel way to adjust the TV ariel when coverage of the Monaco Grand Prix was threatened by poor reception. "Left a bit, no too far, go back, that's it, hold it right there Alan!" Monday was a more relaxed day but there were still two tournaments for visitor to enjoy. The top three won assortments of Pinballers Anonymous, Pinball News and Bally mugs, with all 3 going to both winners, 2 to the second place players and 1 to the third place players. Mugs were donated by Pins Anon, Pinball News and David Rolfe. Monday was definitely a much quieter day than the previous two but that allowed people to chill and to play games they were unable to get on over the weekend. It seems everyone who attended has a blast and discovered - or re-discovered - the fun of some classic games and some newer ones too. Mike Parkins' Black Knight 2000 was a revelation to many, playing fast and sounding loud. John Helliwell's new Family Guy - which he kindly allowed to be played all weekend before taking it home for the first time - was also very well received with players loving Stewie's miniature pinball and getting a kick out of all the sound calls. 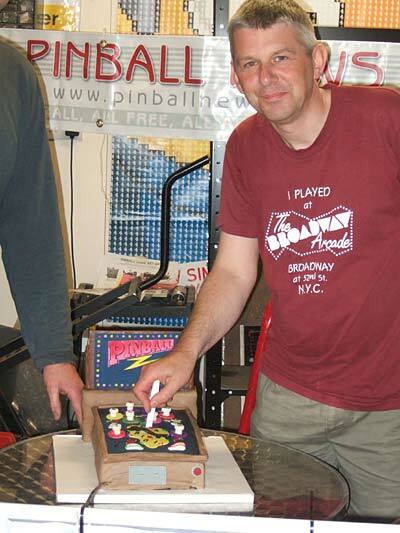 So, many thanks to Nick for a great three days of pinball. 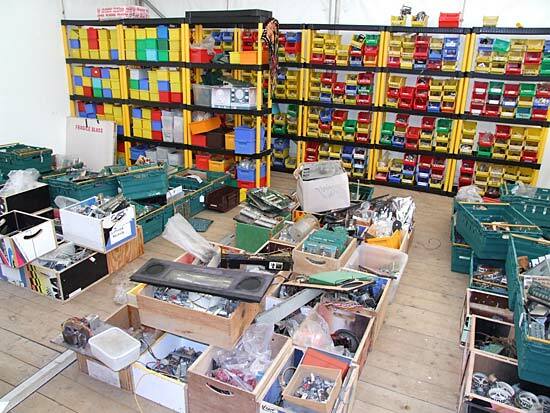 By the end of Monday, a total of £800 ($1600) had been raised for the Fire Services National Benevolent Fund and the process of clearing up could begin.